Read the Background section of this module for more information about the effects of nicotine and alcohol on the brain and body. Provide students with the Module 2 magazine Legal Doesn’t Mean Harmless for background knowledge. Photocopy and pass out the “Nicotine and the Brain” and the “Alcohol and the Brain” worksheets for students to complete during the lecture. Prepare transparencies and photocopies for the lesson. Cut out puzzle pieces for Activity 1. A drug is any substance that changes the way the body or brain functions. Some drugs are legal for adults but illegal for children and teens. Other drugs, such as cocaine, are illegal for everyone. The most widely used legal drugs for adults are alcohol and nicotine, which is found in tobacco. 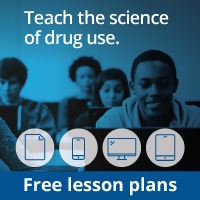 Tell students that the goal of this lesson is to learn about how nicotine and alcohol change the brain. Legal doesn’t always mean harmless! * Drugs you buy over the counter and drugs prescribed by a doctor are also legal and should be safe and effective when taken according to the directions. However, they are illegal when used by someone else or not as prescribed. They will be covered in Module 3, Drugs in the Cupboard. Discussion: After students have read the magazine, facilitate a discussion about nicotine and alcohol by using the following questions. If necessary, review this information with your students using the diagrams provided. What changes in the brain cause nicotine withdrawal symptoms? How does alcohol affect learning and memory? What are possible consequences from drinking a lot of alcohol in a short period of time? How does alcohol affect thinking, planning, and decision-making?